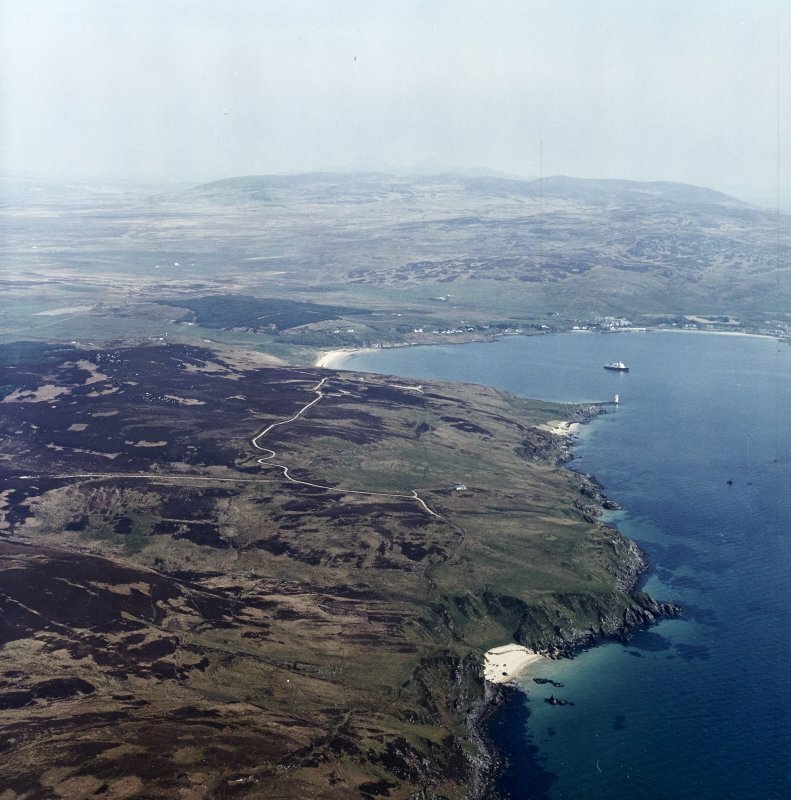 General oblique aerial view looking across the remains of the farmstead, townships and lazy-beds towards Kilnaughton Bay and the S of Islay with the Paps of Jura beyond, taken from the SW.
General oblique aerial view centred on the remains of the township and rig with the remains of the farmstead in the distance, taken from the SW.
Oblique aerial view centred on the remains of the township and rig, taken from the ENE. 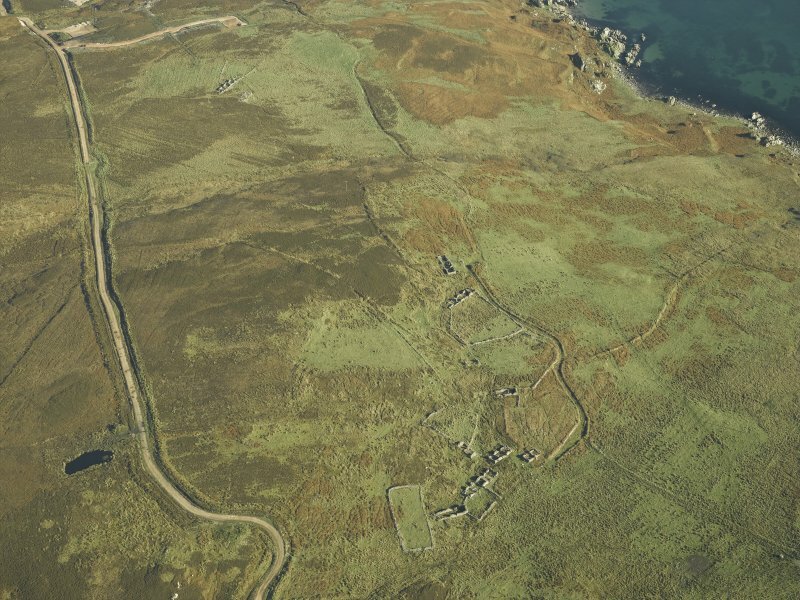 General oblique aerial view of the remains of the farmsteads, field boundaries and rig at Lurabus, Islay, taken from the SE. 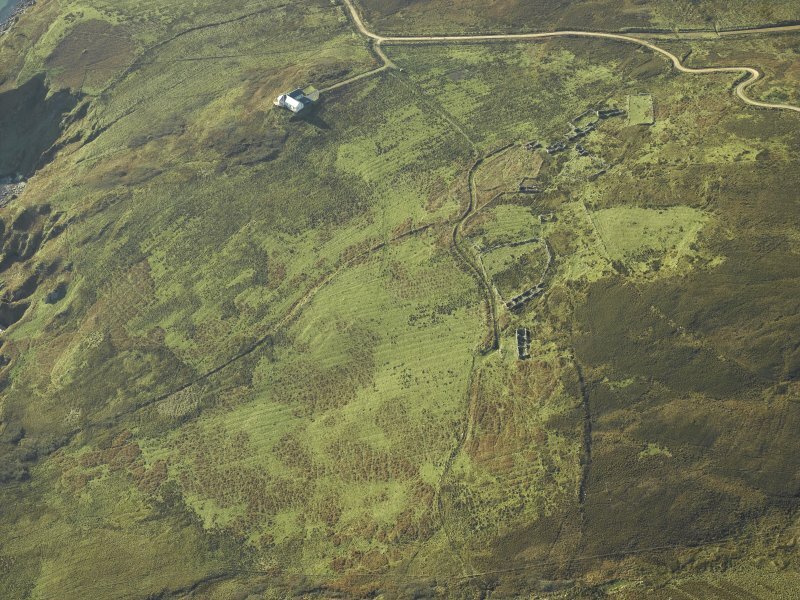 Oblique aerial view centred on the remains of the township and rig, taken from the SE. 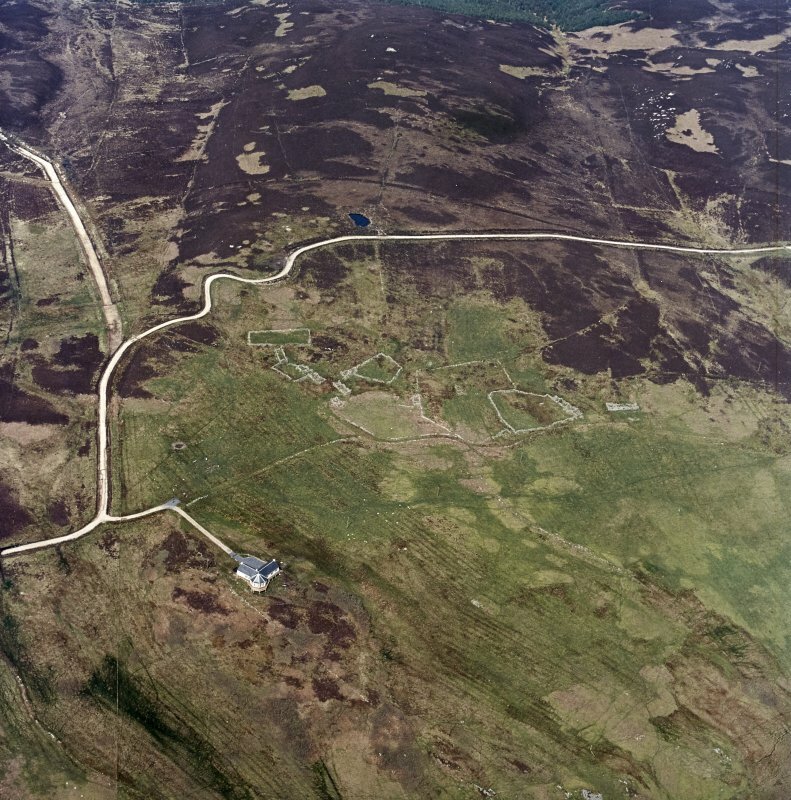 Oblique aerial view of Lurabus, looking W.
Lurabrus Township. Detail of corn-drying kiln from South. Lurabrus Township. Building D, aumbry and fireplace in North East wall. 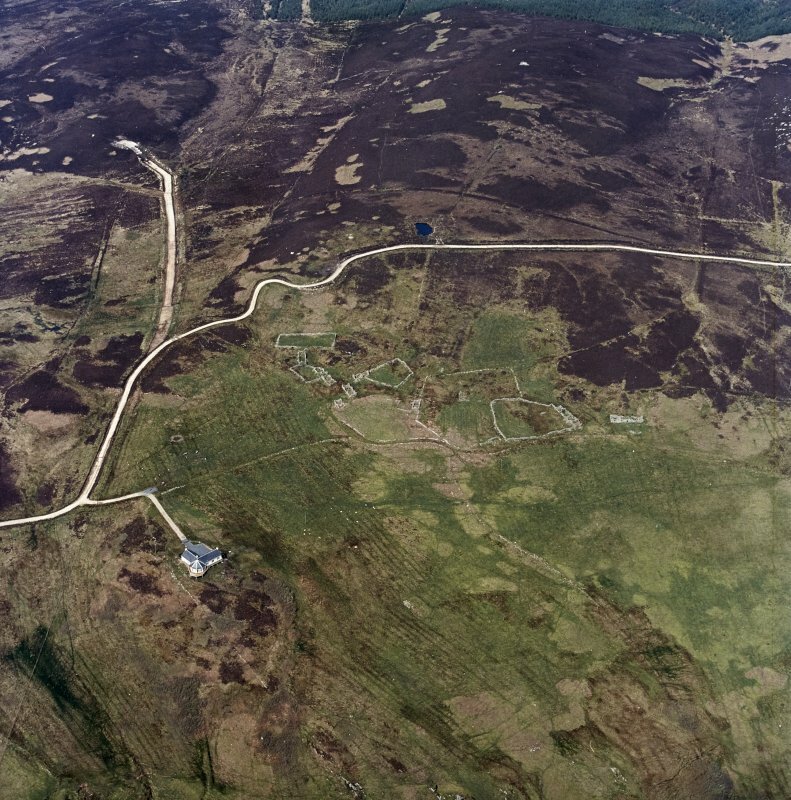 Oblique aerial view centred on the remains of the township and rig, taken from the NW. Lurabrus Township. View from West. 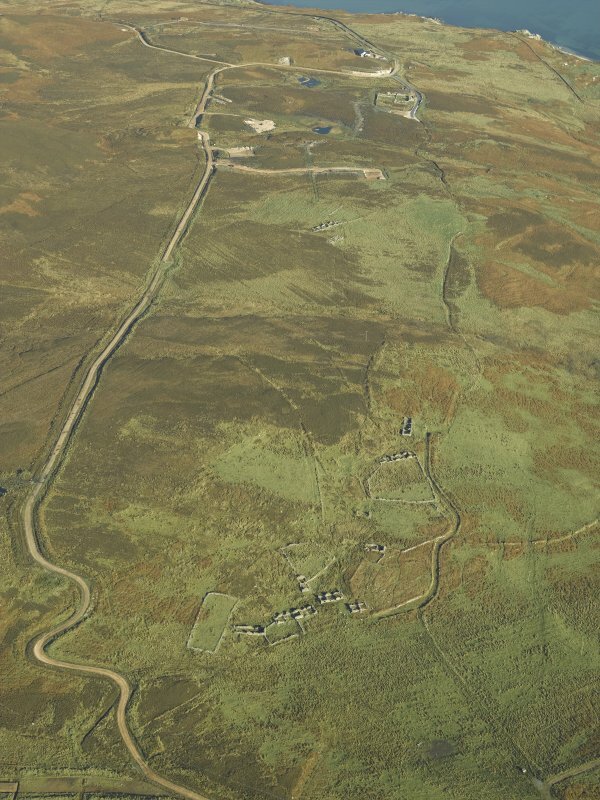 Oblique aerial view centred on the remains of the township and rig, taken from the W.
Manuscript annotation on RCAHMS working map notes 'fairly well-preserved. Gable-ended buildings of stone + lime + stone + clay'. Lurabus is noted as the largest and best preserved settlement in the area; some buildings have cruck-slots'. over 75 m OD on ground sloping towards the S and SE. 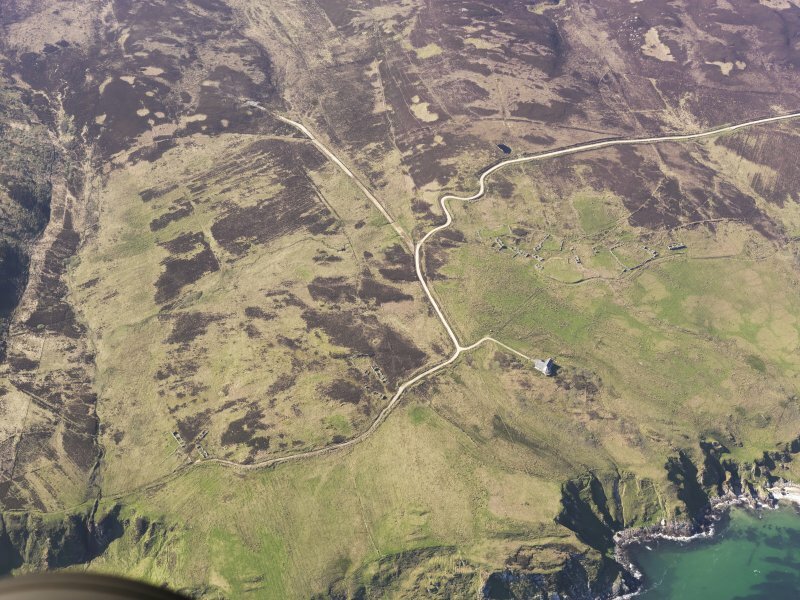 The site overlooks the entrance to Kilnaughton Bay but, although the township stands only about 300m from the shoreline, access along this cliff-bound stretch of coast was probably much restricted. 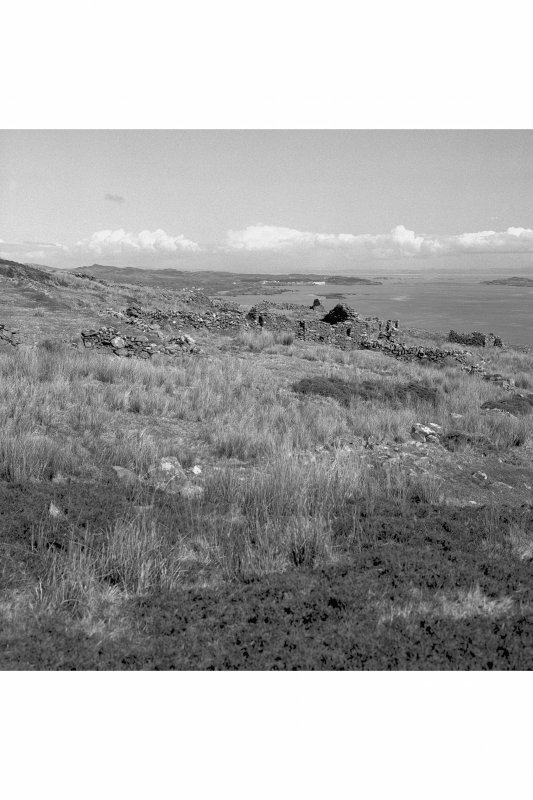 The remains of a track which linked all the settlements on the E side of the peninsula from Kilnaughton to Stremnishmore runs around the lower or southern edge of the site where it is joined by a second track leading in the direction of Upper Cragabus. 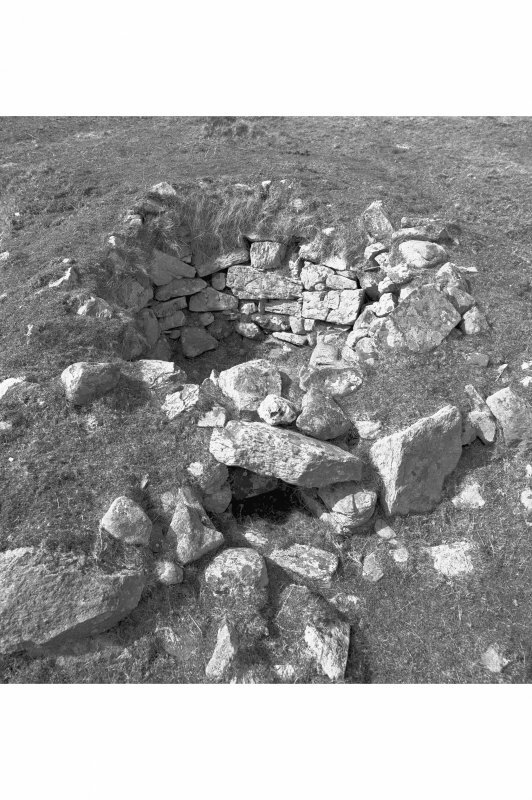 Unlike some of the neighbouring townships, Lurabus does not appear to have been closely associated with a natural watercourse, but the positions of three wells or springs shown on earlier Ordnance Survey maps can still be seen. 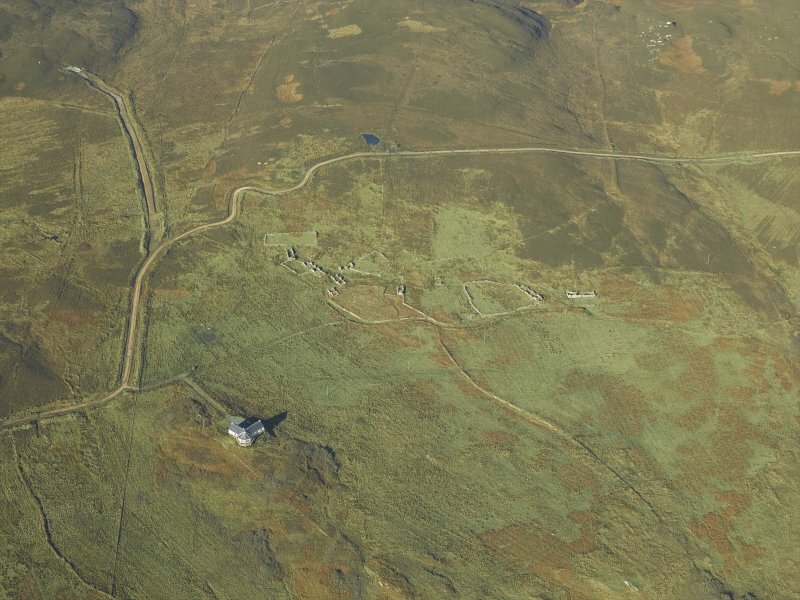 The majority of the buildings (A-G) are clustered around the W end of the site, with a lesser group (K-L) to the E.
Except for building L, which has been erected on a terraced platform cut into the slope of the hillside, they are aligned to take advantage of natural drainage and tend to follow the fall in ground level. The buildings are associated with enclosures of various sizes, the walls of which are of drystone or stone-and-turf construction. 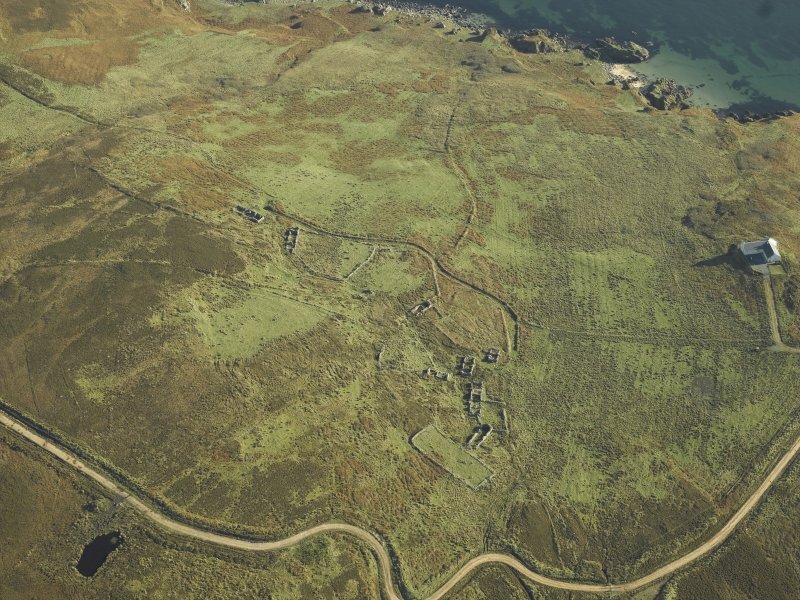 There is clear evidence of rig-cultivation to the S of the settlement and within one of the larger enclosures, while aerial photography has shown traces of further ploughing on the higher ground to the N.
buildings D and G, also appear to incorporate vestiges of earlier building-foundations. cross-wall of this building, and outside the SW angle there is a small mortar or knocking-stone. hollow-ways, especially in the vicinity of building K.
the estate of Kildalton. 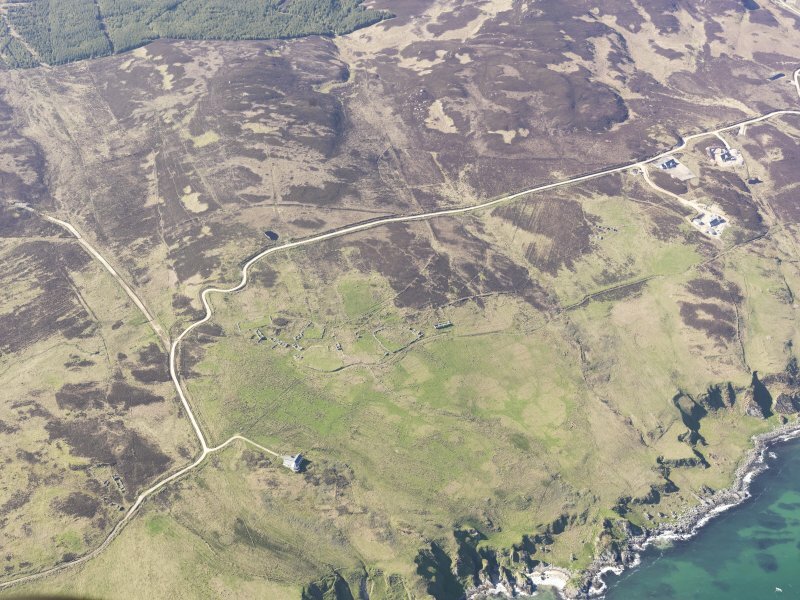 (Islay Book; McDougall's map) A rental of 1733 shows that the farm was held jointly by eight tenants, and from the evidence of a mid 18th-century survey and map it appears that its lands comprehended the whole of the coastal and moorland area to the E and N as far as Cragabus and Kilnaughton, thus incorporating the neighbouring settlements to the NE. (Islay Book; Mcdougall's map) A detailed account of the population of the township in 1839 ('Description of the population of Oa' in Kildalton Papers [microfilm in SRO RH4/92/2). A tombstone at Kilnaughton commemorates John Campbell 'late tenant Lurabus' who died in 1816. showed that at that date there were eight tenants who, together with the cottar families, formed a total population of 120 persons, and their stock included fifteen horses. There was one weaver and a slate-quarrier, who had a son and lodger also recorded as quarry-workers. A printed rental of 1848 ('Description of the population of Oa' in Kildalton Papers [microfilm in SRO RH4/92/2]. A tombstone at Kilnaughton commemorates John Campbell 'late tenant Lurabus' who died in 1816. (Kildalton Papers, loc. cit.) referred to the fact that the Lurabus leases had expired during the previous year, and thenceforward were being renewed only on a yearly basis. 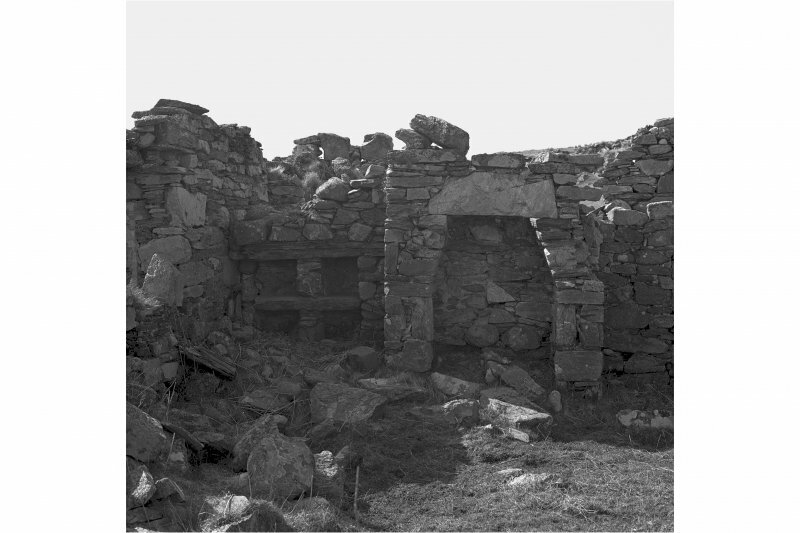 It is thus likely that most of the buildings were abandoned during the third quarter of the 19th century. A township comprising nine unroofed buildings, two of which are long buildings, one partially roofed building, one unroofed circular structure, four enclosures and a system of head-dykes, which are partially shared with the farmstead to the NE (NR34SW 24), is depicted on the OS 1st edition 6-inch map (Argyllshire 1882, sheet ccxxxix). 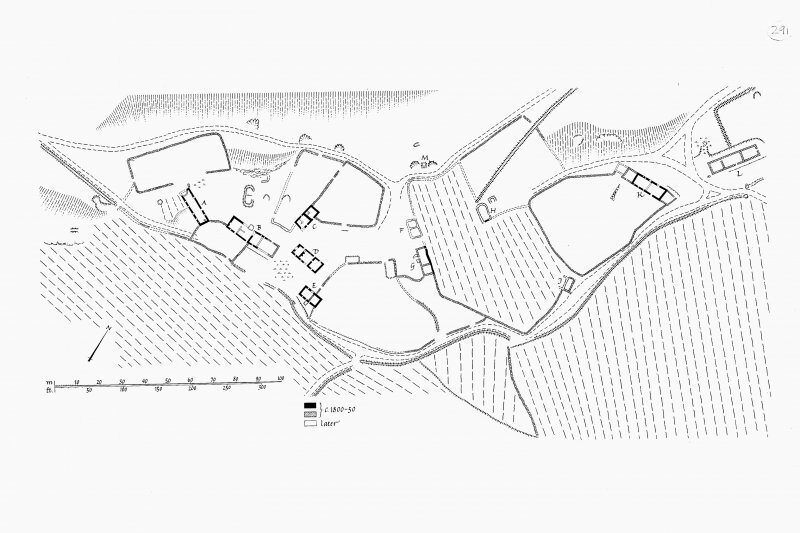 Nine unroofed buildings, three enclosures, a disused kiln in the same location as the unroofed circular structure on the 1st edition, and the head-dykes are shown on the current edition of the OS 1:10000 map (1981). 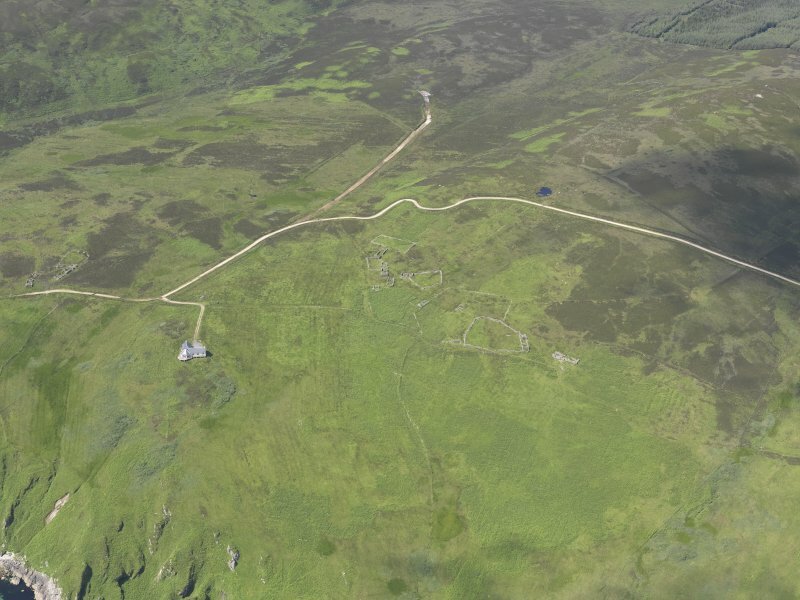 Information from RCAHMS (SAH), 9 December 1998.